Y’all. I went through my about 8 different titles before settling on the “side dish” addition. It started as salad…but that was before I tasted it warm. Then I decided that salad was the wrong and perhaps pilaf would be better. But then I tasted it after it had chilled. And I was back to salad. Then I thought this would make the perfect lunch for a chilly fall day. But it’s still really hot here and thought it would make a great chilled lunch for a hot fall day. See why this was so hard for me. So I settled on the generic “side dish”…but eat it as you wish, when you want. For breakfast, lunch, dinner, as a side, as a salad. I hope you enjoy it! P.S. This would be a great gluten-free alternative to stuffing…holidays will be here before we know it! Heat the butter and olive oil in medium saucepan. Add the onion and basil and sauté for 2 minutes. Stir in the arborio rice and then quickly pour in the 2 cups of chicken broth. Bring to a boil and let the broth soak into the rice. Then add the 1 cup of water and continue cooking until it has been absorbed. Meanwhile, sauté the mushrooms in the olive oil for 2 minutes, then add the spinach and cook until most of the leaves have wilted. Transfer to mixing bowl. Once the rice has cooked, add to the mixing bowl and combine with the mushrooms and spinach. Season with salt and pepper. Stir in the apple pieces. 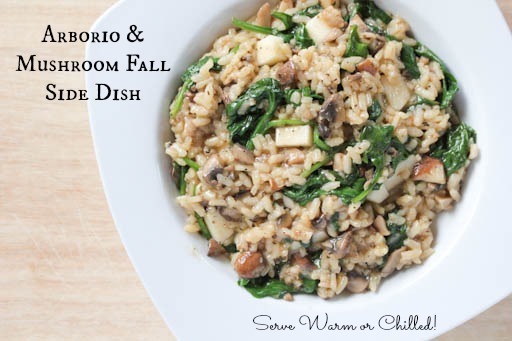 Serve Arborio & Mushroom Fall Side Dish warm with chicken, or chilled for a quick lunch. Originally posted on Mushroom Channel here. Disclosure: I’m a freelance writer for the Mushroom Channel blog. I receive compensation for my time and for ingredients involved in recipe development. Opinions and recipe naming problems are my own.